Madrid, Galeria Pepe Cobo, John Baldessari: Arms & Legs (Specif. Elbows & Knees), Etc., Part II, January-February 2008. Executed in 2008, Arms & Legs (Specifically Elbows & Knees), etc. (Part Two): Elbows, Knees, Shirt and Tie (with Blue Barrier) is a prime example of John Baldessari's quest to meditate upon the paradoxical nature of communication and his exploration of human identity through the fragmentation of the body. Presented with a predominantly blank black backdrop, Baldessari incorporates visual clues through a montage of anatomical features and anthropomorphic shapes. 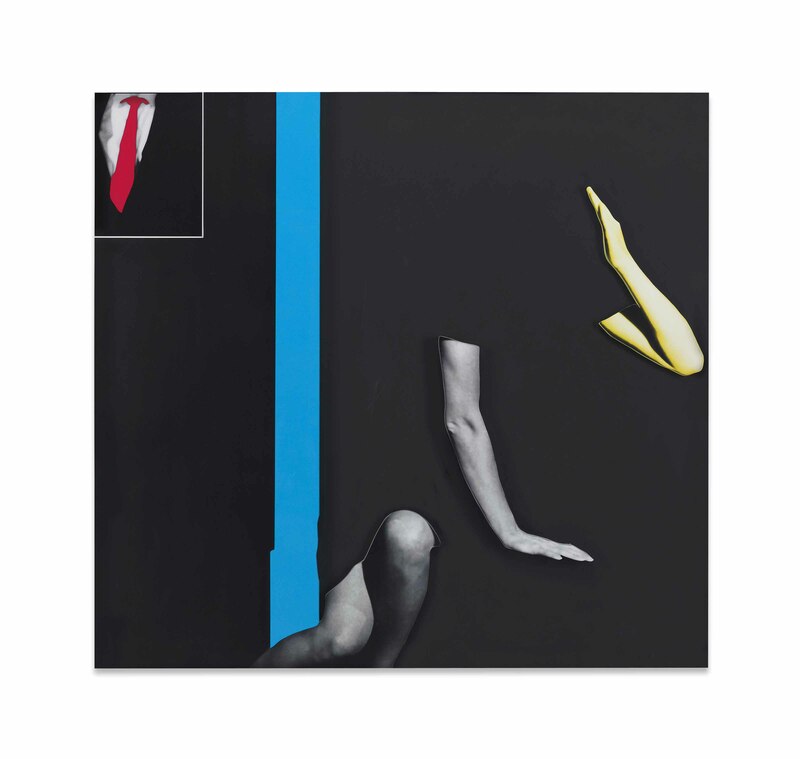 Composed of digital photographic prints with over-painted and richly laminated collage elements, the viewer is prompted to "read" the multi-layered picture planes - a cropped image of a suited male torso in the upper left corner and a pair of seductive arms and legs anchoring the other side of the composition. With great graphic simplicity, the seemingly arbitrary juxtaposition and overlapping motifs are a playful yet strategic practice that questions the boundaries between photography, painting, sculpture and installation, as well as the unexpected double life of the image. Baldessari dramatizes the ordinary and takes things out of their context - his work is ultimately characterized by the semantics of "reading" imagery. Over a pioneering career that spans five decades, Baldessari has been an innovative force in contemporary art. In particular, his use of appropriation, alteration and montage to challenge the narrative potential of images has created a great body of work that strikingly bridges conceptual art and popular culture. From the 1960s, Baldessari has immersed himself in thinking about totality - what was part and what was whole - which continues to be a central concern in his work. Arms & Legs (Specifically Elbows & Knees), etc. (Part Two): Elbows, Knees, Shirt and Tie (with Blue Barrier, created a year before Baldassari won the Golden Lion for lifetime achievement at the Venice Biennale, harks back to his early practice in the 1960s; moreover, the use of the readymade image nods to the legacy of concepts championed by the likes of Marcel Duchamp. As such, Baldesarri invites the viewer to look beyond the surface and outward simplicity to render new configurations of meaning. Through Baldessari's process of election and montage, of assembly and removal, this work speaks boldly of the artist's ongoing experiment of not only the subjective nature of representation and photography's relationship with painting, but the function of art itself.